Recently while trolling the internet, I came across this design tied by a fellow Blogger. He was tying the design mainly for use as a leash, but this is a tough, rugged looking design that can be used in many different ways. 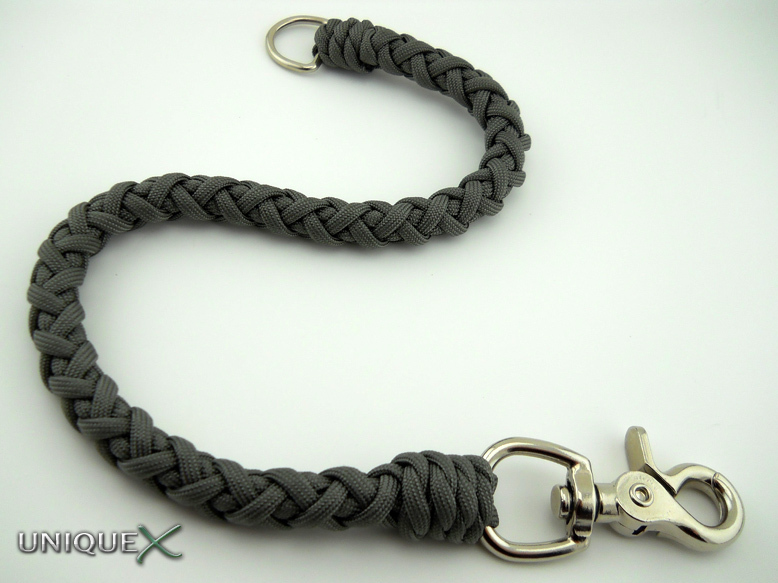 Before tying this lanyard, I thought about using this design as a strap to replace the "Oh Crap" handles in my Jeep. Tying this design will take patience and time to create a great looking piece. Since I usually try to only post knot designs that are fairly easy to tie, I hesitated on posting this here, but I feel that the novice knot tying enthusiast can tie this with a little effort. It is tied in two parts which will make it difficult to estimate the amount of cord you will need. The full length of my lanyard was 16 inches and required 12 feet for the Turk's Head section, and two 40 inch lengths for the braided core. Determine the length of the lanyard and estimate the amount of cord you will need. 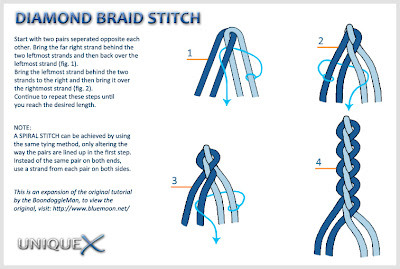 You will need two strands for the braided section and one long strand for the Turk's Head section. 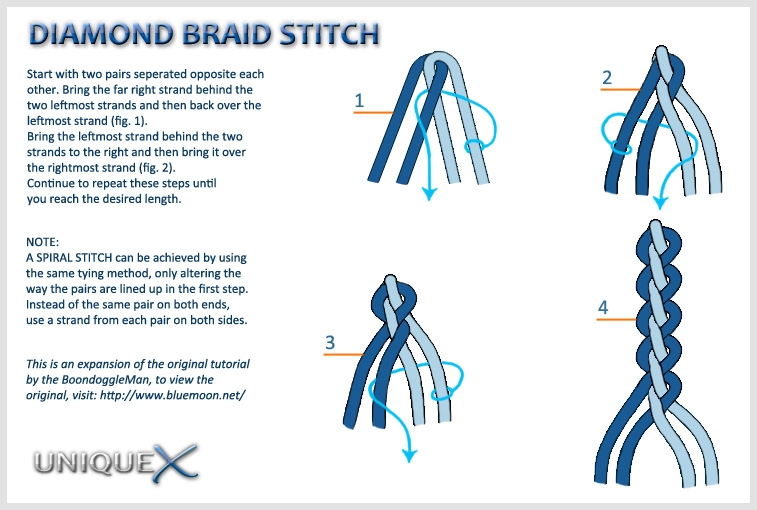 Take the two strands, middle them and then start braiding as shown in pictorial. Once you've completed the braided section for the length of the lanyard you will need the long strand. Tie a Long Two Bight Turk's Head over the braided section, Bud Brewer created the tutorial on tying this Turk's Head that I often use. When tying the Turk's Head, make sure the strands fall in place over the braiding in order to get the best end result. Finish by adding West Country Whipping to cover-up the loose ends of cord on both ends of the lanyard. Do you mean you used 12' of cord for the two Turk's Heads, i.e. 6' each? @Anonymous: One Turk's Head was all that was tied in this post. Did you mean the knot design underneath the Turk's Head? If that's the case, it was a 4 Strand Braid (also called Diamond Braid Stitch), which used 2-40 inch strands of paracord. The 12' was only for the Turk's Head wrapped around the Diamond Braid Stitch. I think that what he meant was, what are the two knots at the ends of the lanyard (connecting to the metal rings), and what was the length of the paracord used. @Anonymous:The knots used on each end of the lanyard is called West Country Whipping. You're going to need around 20 feet for a lanyard that is roughly 18 inches long. Thanks for the quick reply. I'll have to tie this one soon. Your turks head link says account suspended. Do you have another link you can suggest? That's disappointing, but luckily Stormdrane made a video using the original tutorial that I referenced in this post. Here is the YouTube video.